Arriving at the unassuming offices of Dame Vivien Duffield, in West London, you would not be aware that the Clore Duffield Foundation, which she created out of the merger of the Clore Foundation, inherited from her father, and the Vivien Duffield Foundation, which she set up with her own money, is the leading funder of the arts and culture in the UK. I enter through a small corridor, at the end of which, are double doors into a large and airy office. Stepping though them, the importance of the woman I am here to meet becomes apparent. It is the walls that give it away. They are adorned with awards and honorary degrees, from the array of institutions in the UK that she has supported through the Clore Duffield Foundation, as well as Israeli organisations that the Clore Israel Foundation in Jerusalem, which she also chairs, has funded. Despite her reputation as a no-nonsense, straight-talking matriarch of the arts, I found Dame Vivien to be welcoming and even a little cautious. She does not give many interviews, preferring instead to let her actions speak louder than her words. However, as our talk progresses, her boundless enthusiasm for philanthropy and the arts, and a sustained connection to her Jewish roots shines through. It was from her father that she developed the passion and responsibility for philanthropy, interest in the arts and Jewish values. Charles Clore was a self-made man, establishing his name and wealth through an array of retail ventures, notably the department store Selfridges and the once ubiquitous high street store brands of the British Shoe Corporation. He was to become equally well known as one of the great scions of philanthropy and in particular for his support for Israel. Dame Vivien knows little of her father’s upbringing in London’s East End. He was born in 1904 to parents who had recently emigrated from Riga. “They came with nothing except a sewing machine, as his father was a tailor. But no one even knows the original family name. He never talked about his past.” This may be due to the difficulty of his childhood. His mother died when he was very young, and his father soon after moved to Israel, where he lived out the rest of his days. Charles visited his father only once in 1927, and did not return to Israel until he had a family of his own, 30 years later. At the invitation of Sir Isaac Wolfson, they stayed at the Weitzmann Institute. This experience inspired his support for the Institute and other Israeli causes. By that time, Charles had separated from his wife, Francine Halphen, who he had met soon after the war. Though they had two children, Vivien and her older brother Alan, the marriage did not survive. “She missed France, and returned there. She was much more cultured, from a wealthy Parisian Jewish family. Her father survived the trenches, emerging from the First World War as a decorated Major. But he made a promise to himself that he would never have a cold meal or do a day’s work again, and rigidly stuck to both those. So he was not a great role model. It was Charles who brought up the children, and from whom Dame Vivien believes she has inherited many of her traits. “He was very philanthropic and always very generous, loved the arts, and had a great eye for it.” He also was very protective of his only daughter. After she completed her undergraduate degree at Oxford University, he forbade her continuing her studies in the USA. He also stymied her hopes of following him into business, believing that “the boardroom was no place for a woman”. He was very much a typical Jewish father of that time and no doubt this played some role in Vivien marrying young. Though it was the fact that she was marrying out that aggrieved him more. It was from this first marriage to John Duffield, who was to become a wealthy financier, that she has two children, Arabella and George. Her marriage did not last, on which she comments “it is possible to enjoy a successful marriage, family life or career, but near impossible to experience all three.” Of her children, she is evidently proud. But her children were not brought up Jewish and she regrets not passing on to them the values she received from her father. Many institutions have benefited greatly from the beneficence of Dame Vivien Duffield. But two in particular have her to thank for their very existence. It was on a visit to the children’s museum in Boston, USA, that Dame Vivien had her first eureka moment. She was determined that the UK should have its own hands-on exhibition for children, a place that celebrated both play and learning. She realised that vision in 1992, having committed most of the funding required to establish Eureka! The National Children’s Museum – located at the suggestion of Prince Charles, in Halifax in Yorkshire. Many questioned the location, chosen in an economically deprived area to serve as a catalyst for regeneration, but it has benefitted a huge number of young people in the north who would never have got to a London museum. Living in Leeds at the time I remember the thrill of such a stunning museum arriving on our doorstep. Now it has 250,000 visitors a year, an impressive number for a regional museum that charges for entry (as Dame Vivien strongly believes all museums should). 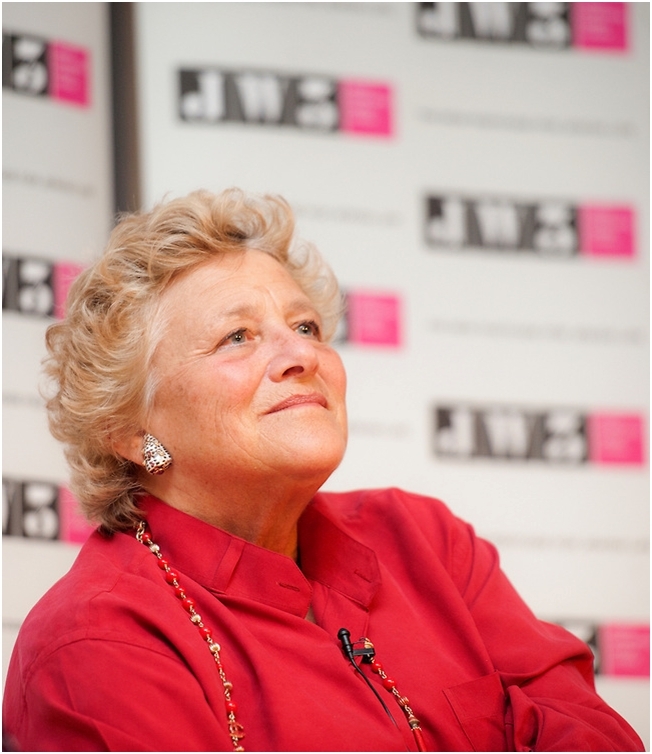 Dame Vivien hopes the success of this venture can be replicated with JW3, the Jewish Community Centre (JCC) for London, the second UK institution that owes its conception to her uncompromising vision. Many questioned whether the JCC model, so well established in North America, could be adapted to the UK, or whether there was a need for such a project. She hopes that its success will exceed all expectations, in the size and diversity of its audiences, in the quality of its programmes. And that, like Eureka!, JW3 will confound critics of its location. It is not in the Jewish heartland of Hendon or Golders Green, nor in the cultural hub of Central London. It is on the busy Finchley Road, across the street from the Camden Arts Centre and Dame Vivien is convinced this will work for it. Such stubbornness has served her well. Few philanthropists have given away as much of their wealth, or as greater proportion of it. It is estimated that she has donated over £300 million through her Foundations over the last 40 years. Most impressively she has helped to raise many multiples of that, most recently leading a one billion pound fundraising campaign for Oxford University and, most famously, in her former role as trustee of the Royal Opera House, helping to secure over £100 million to build its current home in Covent Garden. And at almost every gallery and museum of note in the UK today, from the British Museum to the National Gallery of Scotland, you will find a Clore Learning Centre. She would like to see a more pluralistic and less polarised society in Israel but is deeply pessimistic as to whether that will ever be realised. However, she is encouraged by the indications of a greater engagement in philanthropy in Israel. It is this responsibility to give, which she inherited from her father, and has driven her own philanthropy, and notably that of her children too. “Simply, if you have money, you have a duty to give.” However, she notes that philanthropy is evolving too. For many years hence though, it is likely that the Clore Duffield Foundation, with Dame Vivien at its helm, will continue to lead and inspire ever greater philanthropy. I am intrigued to know whether there will be any other landmark campaigns that she will personally spearhead now JW3 has opened its doors. “I do not know what the next challenge is. I haven’t worked out what I want to do next. But there may be one last project.” So watch this space!